The rise of the core has led to a profusion of misinformation and confusion. Eliminate the training flubs that keep your abs in the shadows! “The first rule to get abs is: you do not do sit-ups. The second rule to get abs is: you DO NOT do sit-ups.” – Tyler Durden, Fight Club. OK, Tyler didn’t really say that. But as women everywhere reminded their dates in the post-movie recap, he did have some serious abs. Or maybe it was the guy who played him—you know, ol’ what’s-his-obliques. But whomever they belonged to, they were the kind of muscles that weren’t just made in the kitchen. They were carved by hard training, and revealed by smart diet choices. But here’s the thing about ab training: What you do is only one half of the equation. What you don’t do is the other—and I’m not just talking about the usual pre-photo shoot fitness model tricks like avoiding sodium, carbs, happiness, or air. I’m referring to the piles of abominable abdominal misinformation lurking out there, both on television and in casual conversation. Perhaps more than any other body part, ab training keeps you constantly on guard against making basic mistakes. Below are 10 of the biggest ab training mistakes I see people make. I could say I “always” see people make them, because that’s how people talk about abs, but that’s not technically accurate. I mean, everybody has to blink sometimes, and every once in a while I have to go get a drink of water. But aside from that, yeah, it’s pretty much constant. But if you can minimize—or completely eliminate—these mistakes, you might just see your abs pop out sooner than planned. If you strictly perform isolation ab exercises, you’re making a huge mistake. Compound movements like deadlifts,squats, and overhead presses engage every inch of your core. Don’t forget to include them in your training program. 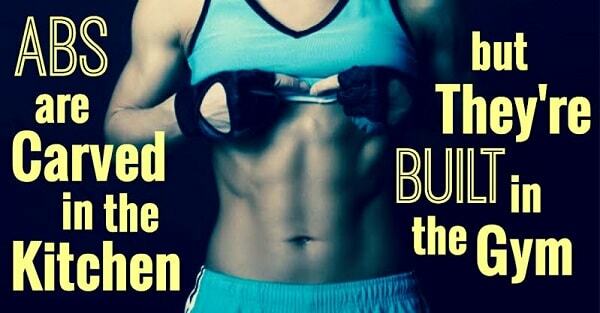 Your abs are part of your core area, which helps stabilize your body. If you fatigue them early in your workout, you will have a hard time doing other ab-intensive exercises like squats. And just so we’re clear, the role that your core plays in squats is to protect your spine, so you want them to have a full tank at that point. Save your ab training for the end. All you need is 15 minutes. If you’re already doing compound exercises like squats and deadlifts, one or two ab exercises for 2-3 sets each at the end of your workout is sufficient. YOU CAN TRAIN YOUR ABS ALL YOU WANT, BUT IF YOUR DIET ISN’T IN CHECK, YOU’LL NEVER SEE THAT SIX-PACK. If you can crunch yourself into submission one day and then wake up the next morning ready for more, take it as proof that crunches aren’t actually working your abs as hard as they should be. Try a harder movement and tell me if you’re up for repeating it tomorrow.